Barnsley players Kieffer Moore and Adam Davies surprised a Royal British Legion poppy seller. Barnsley players Kieffer Moore and Adam Davies surprised a Royal British Legion poppy seller and Army veteran with two VIP tickets to the game against Southend United – before Moore put the icing on the cake with an 87th-minute winning header. 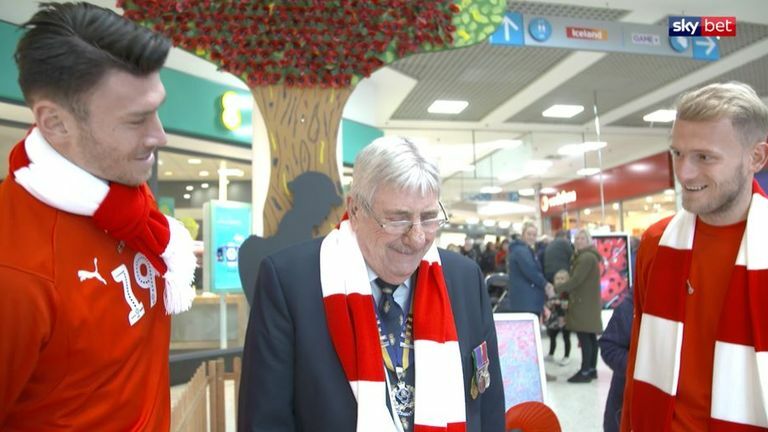 Sky Bet and Barnsley FC arranged the treat for 78-year-old Tykes season ticket holder Charlie Grimshaw, after The Royal British Legion nominated him for 12 years of outstanding contributions to the charity's fundraising efforts. Charlie was part of the team that raised £92,000 for The Royal British Legion in 2017 and was once again out in Barnsley town centre collecting for the cause throughout the 2018 Remembrance period - on the 100th year anniversary of Armistice Day. Charlie served with the Royal Army Ordnance Corps in the Malayan Emergency from 1948-1960, before becoming a police officer, and began collecting for the British Legion in 2006. He is now the Secretary for the Churchfield Branch of The Royal British Legion and the Chairman of The Barnsley Group of Branches. The players surprised Charlie during an interview at the Alhambra Shopping Centre that he thought he was doing for the Legion, talking about the work the charity does in the local area. However, the interview was only set up, so the players could give Charlie a surprise, thanking him for what he has done and offering two tickets for that weekend's game. Moments after they met, Moore promised to score a goal for Charlie during the home fixture against Southend, and duly obliged, with a powerful 87th-minute header to ensure Barnsley took all three points. Charlie said: "I've been watching Barnsley since I was nine and a half. Words can't express how I feel really, I'm bursting with pride. I work for the British Legion, but I don't expect this, I do it because I like it." Match-winner Moore said: "It's massive, when the club told us about what he does for the British Legion and how big a Barnsley fan he is, it's the least we can do to come down and say hello." Goalkeeper and club captain Davies, whose dad served in the army for 22 years, added: "Barnsley is such a big club for the community and when we're doing well, the whole town is buzzing. The supporters mean a lot to us so it's great to be able to come out and meet them like today."